Michael Finkel tells the story of Christopher Knight's life, at times with too much gusto. When word broke that the man who had been stealing from residents of the North Pond area of central Maine for nearly three decades had been caught, Mainers were captivated by the tale that emerged of Christopher Knight’s life. As the decades had passed, many believed the rumored hermit of North Pond was a myth. 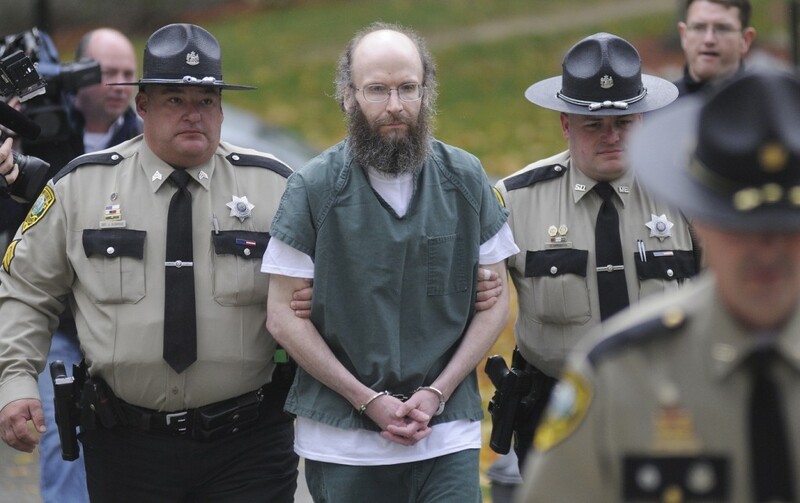 Michael Finkel’s engrossing new book, “The Stranger in the Woods: The Extraordinary Story of the Last True Hermit,” makes clear that Knight was very much a real person. The main story Finkel tells in this book is familiar to anyone who followed news reports of Knight’s arrest or who read Finkel’s 2014 GQ article, on which this book is based. It is the story of a young man who, at age 20, literally walked away from his job, his family, his responsibilities and society. He set out into the forest of Maine without food or supplies for living outside for even one night, let alone 27 years. 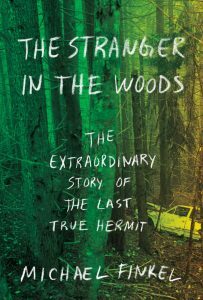 “The Stranger in the Woods: The Extraordinary Story of the Last True Hermit.” By Michael Finkel. Alfred A. Knopf. March 7, 2017. Hardcover. 203 pages. $25.95. Finkel will be in Maine this week for a series of events, including 7 p.m. Tuesday at SPACE Gallery in Portland; 7 p.m. Wednesday at Barnes & Noble in Augusta; and 5 p.m. Thursday at the Waterville Opera House. For a full listing of events, go to michaelfinkel.com. While we never really find out what compelled Knight to walk into the woods in 1986, we do learn about what life was like for him and how he made it work for all those years. That is a fascinating and, at times, disturbing tale. This story, for the most part, comes completely from Knight himself. Finkel exchanged handwritten letters with Knight while he was jailed and had nine jail visits with him. Since Knight supposedly lived alone and had practically no contact with people during his many years in the woods, his version of the “truth” of his experience – and his alone – is all we have. Finkel unreservedly believes Knight, but he acknowledges that not everyone is sold on Knight’s story. Most residents of North Pond think Knight’s claims of never using a fire to heat his camp, that he never got sick or needed medical care, that he had no contact with his family (who never reported him missing) and that he spent every night in his camp, even through life-threatening winter conditions, are flat-out lies. The author believes that Knight is “practically incapable of lying,” but he doesn’t provide enough evidence to support that. Knight lived an extreme lifestyle and worried about getting caught. To make his survival possible, he developed skills that enabled him to move stealthily among the residents of North and Little ponds. He studied these people so he knew their patterns and he went through their homes and their personal belongings. Intentionally or not (he claims not), he terrorized those residents for years. Is a person who is capable of doing all that incapable of lying? In other areas, the evidence Finkel supplies to support Knight’s story as he tells it is strong. There’s the physical evidence of Knight’s camp, the decades of experiences of the residents of North and Little ponds, and the expertise (and belief) of law enforcement and other professionals who examined Knight and his case. Finkel is a skilled storyteller, and those skills are clearly present in this book as he weaves psychoanalysis and medicine, the mechanics of outdoor survival and centuries of hermit history with Knight’s life story to create a tightly written, compelling narrative. Finkel has written for National Geographic, Rolling Stone, Esquire, Vanity Fair, The Atlantic and other major publications. 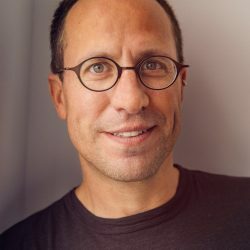 His 2005 book “True Story: Murder, Memoir, Mea Culpa,” was made into a movie (“True Story,” starring Jonah Hill, James Franco and Felicity Jones, released in 2015). But Finkel committed a journalistic sin that could have killed his career when he falsified parts of a 2001 story he wrote about child labor in West Africa by creating a composite character who was positioned in the article as an actual person. In the years since, the author has taken great pains to prove to the world that everything he reports is factual and that he is trustworthy, and he does that in this new book, as well. The transparency is welcome, but the heavy-handed insertion of himself into the story is not. It may be that his efforts to prove himself a trustworthy journalist led him to insert himself into Knight’s story, or he may have been making a stylistic choice. If so, it was a poor one. Knight’s story is compelling enough to stand on its own. Finkel’s presence in the story is distracting, sometimes annoying, and at times disturbing. The description of his pursuit of Knight seems more like the thoughts and actions of a suitor (and frankly, at times, of an obsessive stalker) rather than of an objective journalist. And they expose a bigger problem: From the beginning, Finkel readily concedes that he is captivated by Knight and his story – that he respects, admires and likes him – but the idea that Knight is a “true hermit” is clearly a construct of the author’s own imagination. Even as he relates that Knight stole from and terrorized his neighbors, he comes across as smitten with the romantic notion that Knight sought a life of solitude for some higher purpose and that he has some wisdom to share as a result – even though he acknowledges that Knight never considered himself a hermit, doesn’t believe he has wisdom to share and actually expressed concerns about how Finkel and others would romanticize him in an effort to show their admiration for him. Finkel does try to temper his admiration by repeatedly reminding readers that Knight is not a saint. However, these frequent reminders come across as more of an insurance policy so he can indulge unreservedly in his fantasy of Knight-the-hermit. Still, the book as a whole is thought-provoking and enduring, one that will leave readers thinking deeply about modern society, the search for meaning and the impact of solitude.